I’m an ardent San Francisco Giants fan. I learned to love baseball as a parent of a Cupertino National Little League player — and now that my son doesn’t play Little League anymore, I’ve transferred that passion to the Giants. The first poem I am sharing today is by May Swenson. She’s a favorite poet of mine, because her language is so simple and direct. Nothing too tricky about her poems, yet they still have beauty, depth, and even mystery in them. This poem is called “An Analysis of Baseball” — which, as my smart Monta Vista High School student poets would say, is a a pretty ironic point of view. Be sure to click through the link to see the whole poem in its proper layout. 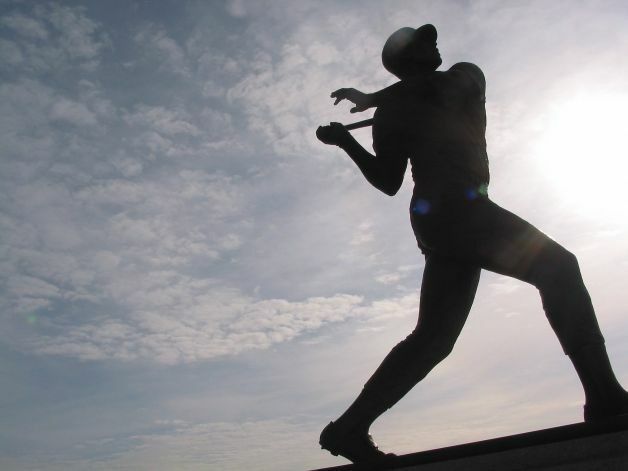 A longer, more elaborate and especially delightful poem by a famous American woman is “Baseball and Writing” by Marriane Moore. Miss Moore takes much of the language for her poem from sportscasters of her generation. Here’s the second stanza. (The poem reads better on the Poets.org site. Don’t ask me why I can’t get it to reproduce here correctly.) Make sure you read this one out loud. The photo at the top of this post is of Miss Moore throwing out the first pitch in Yankee Stadium in 1968. There are a lot of baseball poems. A lot. I’m not sure what it is about poets, but baseball seems to be their sport. I wrote a poem for my daughter’s softball team which was published in a local journal, The Sand Hill Review, and one for my son’s baseball team which was included in the 2008 California Poets in the Schools statewide anthology. I also noticed this poem — “Poem for Giants,” by Matthew Zapruder — on SFGate’s website, a few days ago. It takes you on a bit of a journey, but a good poem will do that.